Bright White Bathrooms are clean, minimalist, romantic, and larger than life when well-designed. Bathrooms should be designed with total relaxation in mind…and a white color palette is totally the answer to that! White expands the room, no matter if your bathroom is in a studio apartment or one of twenty in a multi-million dollar mansion. 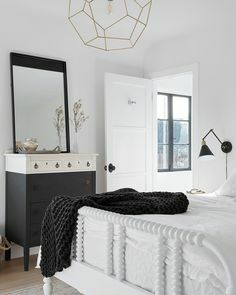 A color palette of white allows can be totally interesting when you start to play with shapes like hexagons in the rugs, herringbone tiles on the floors, circular mirrors above the sinks, and metallic accents in sconces and fixtures. Have a statement piece in your bathroom…my own bathroom does just that with a blue crystal floral chandelier hanging overhead. It is a focal point in the bathroom and it’s different enough that it causes for a second glance. Small Spaces feel infinitely larger when the walls and tiles are white and color comes through as an accent in flowers or fixtures. I love these! I’m so glad I went with white white white and a little black in one of my renovations (the other got colorful encaustic tiles–gotta mix it up). I feel like having a light zen-ish bathroom helps so much with your senses. feeling calmed and clean and organized in that area kicks starts your day so much better!